It extends into staircases and wainscoting. Our guys are true artists and have a passion for wood and it shows through with the work they do. The wainscoting transformed this basic 2000s home into a million dollar view. The wainscoting extends up to the 20 ft ceiling and the staircase. Everything on this staircase was re-done. New treads were installed, sanded and stained. New landings and nosing were installed, sanded and stained. The existing posts were transformed and made into newel box posts with custom trim and wood. New wrought iron spindles were installed as well. The treads were sanded and stained, while the 1970’s metal staircase was torn out and entirely redone. 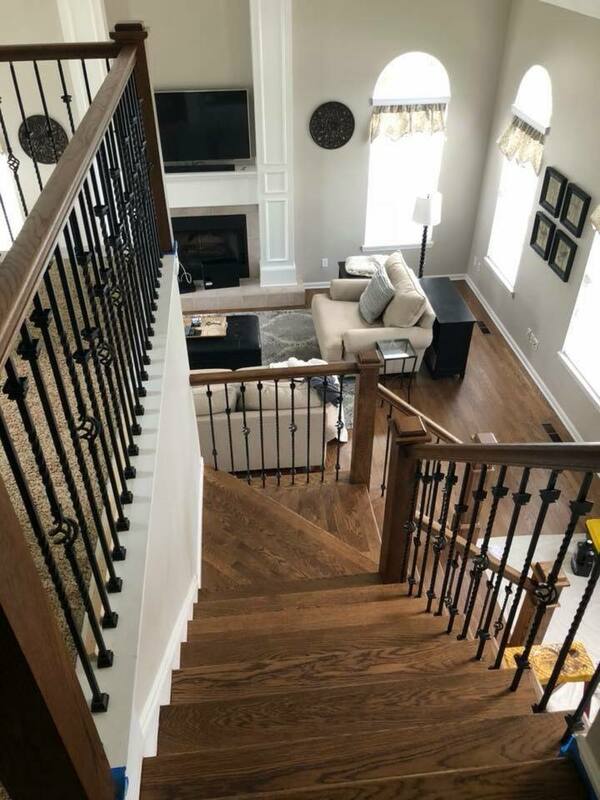 The new wood railing and post would be stained to match the floors which really complements the new wrought iron spindles. Paint will do the trick! This staircase was fully repainted and stained: Treads, risers, railings, posts, stringers. New spindles were installed and painted to match. This staircase was painted while the wainscoting was installed to this foyer and up the staircase. A gorgeous upgrade!